After making a couple of batches of these yummy macaroons, my husband and I took advantage of the sunny December afternoon and went for a walk. While the first batch was cooking, I was sure I’d have enough time to fold a load of laundry. I didn’t. As we finished our walk, we passed my dad raking leaves (my parents live next door), and I mentioned that I had a batch of these coconut cookies with very brown bottoms. My dad is one of those guys who likes a slightly burned cookie, so I said I would bring them over. No sooner had I walked through my back door, I heard a knock. Dad is a major macaroon fan and didn’t want to wait for these treats! When I put a few on a plate and asked if that was too many — I mean, I didn’t want to unload all the bad ones on him — he said he fully expected to relieve me of all the subpar cookies. In his mind, a little extra brown and crispy makes these macaroons even better! NOTE: I have included additional details and photos below based on helpful feedback from several people whose macaroons flattened. This led me to do some investigative work, as I do not want to publish a recipe that is not uniformly successful. I hope it is helpful! Based on how incredibly easy these cookies are, you won't believe how incredibly delicious they are! In a large mixing bowl, mix the coconut and the condensed milk until the coconut is evenly coated. Bake for 7-10 minutes or until flecked with brown spots and crisp around the edges. As all ovens vary a bit, peek a little early and watch closely for the last few minutes until you learn how long this takes in your oven. Remove from the oven, cool, and then store in an airtight container in the refrigerator to maintain optimal freshness. For an even faster preparation, you may spread the batter among two greased, parchment-lined 9×5 loaf pans and bake for 20-25 minutes, or until lightly golden across the top and crispy around the edges. These can be cut into long bar cookies once cool and each piece will still have some of the crispy edge. As the macaroons cool, they tend to stick to the sides of the baking dish, so the parchment will make for easy removal. Following are some details of my quest to determine why some people’s cookies are spreading. This is a batch using Baker’s sweetened coconut which does not contain cornstarch. After trouble-shooting every other possible reason some people have this problem, I looked at the ingredients in different brands of coconut and noticed that cornstarch is not always present. Since cornstarch is a thickener, it seemed likely that this could be the culprit. The edges spread a bit although they were not completely flat for me. However, I did press the uncooked mixture firmly together. I appreciate all comments and feedback and welcome any other tales of experimentation with this recipe. It’s good to have you all on my team! As referred to in the comments, this is a picture of a page from my great-great grandmother’s handwritten cookbook, which I had shared on The Fountain Avenue Kitchen Facebook page. 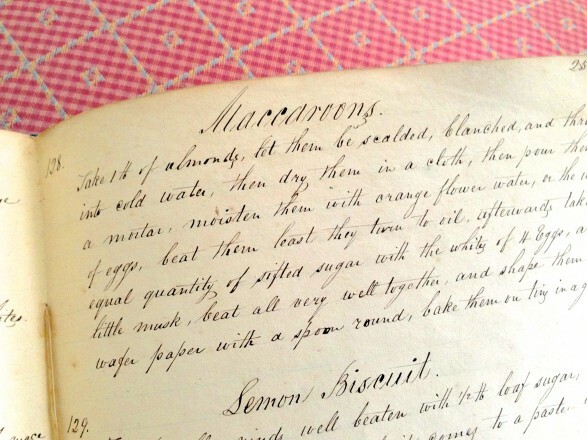 My recipe is a modern take on her version, but I love the history held in these pages…and I always marvel at her beautiful penmanship! This recipe was shared with 365 Days of Baking’s Wicked Good Wednesdays , Sunflower Supper Club Weekend Potluck, Foodie Friends Friday, and Recipes for My Boys’ Thursday’s Treasures. I hope you are back in the kitchen very soon, Mary Lou. Thinking of you! When I saw just 2 ingredients on FB, I had to come check it out! So simple and they look so good. Can’t wait to try these macaroons out! Hope you love them as much as I do, Beth!! Wow! I can’t believe these only have two ingredients! If I had some coconut in the house I’d make some right now! They look amazing!! Love it, Olivia! Sometimes, a little extra crispy hits the spot: ) I hope you enjoy these as much as we do! Thanks so much for the inspiration, Ann! I have heard lots of people talk about these and I keep forgetting to whip up a batch. Here’s to another dark-bottom liker! Enjoy, Jackie! I’m not sure what I missed, but these did not work for me. They became flat, ran together and looked nothing like the picture. Any idea what went wrong? I am trying to think what could have gone wrong, Jen…did you by chance use evaporated milk instead of sweetened condensed milk? If that is not it, let me know! It was definitely sweetened condensed milk. Should I have molded the cookies more when I put them on the baking sheet? I’ve seen other recipes with egg whites- maybe I’ll try that next time. The good news is they still tasted good, even though they weren’t very fluffy. Good to know, Alicia. Thanks for taking a moment to comment! I have yet to freeze these, Connie, as I have so many coconut fans that I share them with if they aren’t gobbled up here first! I wouldn’t hesitate to do so. I truly think they would be fine. If I try, I will report back. If you do, please let me know! Mine turned out flat the first time but second time I added a lot more coconut . I’m going to try with egg whites with it. I am trying to think what could have caused them to be flat since I haven’t had that problem. Did you use sweetened coconut? For me, the small can of condensed milk is just enough to lightly coat the full bag of coconut. Let me know if you have any revelations! Sounds delicious! I’m going to make them tonight when I get home from work. My husband loves coconut. Already have the ingredients. I hope he enjoys them, Angel!! 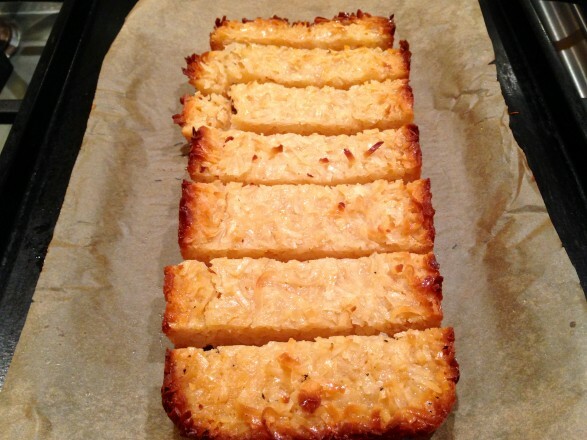 I saw this recipe yesterday and made them last night … PERFECT and delicious!! Will definitely make them for my Christmas Open House. I followed the directions to the “T” – mine cooked for about 10 minutes. Thanks a million!! Thank you for the feedback, Dianne, and I am so glad they are a hit!! OMG! These sound great….I think I will add chocolate chips. Coconut and chocolate are my two faves! This look yummy. Thank you for sharing on Foodie Friends Friday. Please come back Sunday to vote. Thank you and my pleasure, Michelle! Uh oh….sounds like I will HAVE to make these for Christmas goodies. :o) Thanks for sharing that one too! Always happy to find another chocolate and coconut fan!! I have not yet but, coincidently, a friend just told me she did. Based on her report, I would say yes, Alicia! What great cookies! I’m so glad you shared them with us at the party! LOVE a good macaroon that’s crispy outside and soft and chewy on the inside. MMMmmmmm…. Thanks for sharing them at Wicked Good Wednesdays, my dear! Well, I followed these to the letter, just taken them out of the oven and so upset, they have spread everywhere. I used Golden Boy fancy sweetened shredded coconut 400g/14ozs. . and Eagle Brand condensed milk 300 mls. (this is the only size available here in Canada it being the standard size) Used to make these many years ago but added an egg white and they were always perfect. Don’t think I will be trying these again. . I am so sorry to hear this, June. I am perplexed as to why this has happened to a few people. So many people I know have had success with this recipe and I am racking my brain as to what the cause could be. The only thing I can think of at this point would have something to do with variances in oven temperature. Again, I am sorry this one didn’t work out for you. Thank you Ann for your reply. It is strange because I see that so many have had a success with these. As for my oven, I have a temperature thing that you put in the oven to test it and it is exactly spot on. I have taken a picture of them but I don’t know how to get it to you!!! They taste good though even all spread out, have put them in the fridge and we shall see what happens if they break up in pieces we can eat them and not waste them. Again Ann, thank you for getting back to me. You are very welcome, June. I just had one more thought and checked the ingredients on the bag of coconut I use. If you still have the package, could you check to see if your brand of coconut lists cornstarch as an ingredient? Mine does and I am wondering if this, or perhaps another added ingredient, could be the key. One of these days, we might just figure out why this happened! Do you know how many cookies the recipe makes? I want to make this for a cookie swap tomorrow and just need to know how many cookies per recipe. I forgot to count before the last batch was eaten! However, I have a current batch which I made in loaf pans as bar cookies and cut them into 16 bars total. They are big and two cookies could easily be made from each bar. So, I will say that you can safely get 32 individual macaroons. Let me know if this is close to what you get. I hope this helps! Hi again Ann, maybe my problem was that I made them to big which made them spread. I used an egg cup to mold them and it worked perfectly, looked so neat on my tray.However, I only made 24 and I see you make 32, just wonder if this was the problem.What do you think? My hunch is it has something more to do with the coconut. I think I will buy a brand without the cornstarch one of these days and try. When I make these, they really hold together well. I truly don’t think you made them too big. We will figure this out, June!! Hi Ann, well my Golden Boy coconut contains coconut, sugar, water, propylene glycol, salt, sodium metabisulfite and best before date was 13/NO/26. The condensed milk was 300ml.and the coconut 400g. Thinking of making them agian and adding the white of an egg! When I do I will let you know the result. I have never ever found coconut that had cornstarch in it and I guess that is the secret of them turning out well. Thanks again Ann. June. I asked another baker who made my recipe to check her coconut ingredients and get back to me. I don’t want the recipe to be a flop for anyone…am determined to sleuth this one out: ) Thanks for your help with the detective work, June, and have a great day! I just baked a batch myself with Baker’s coconut which does not have cornstarch. I am going to add photos soon. They were a little runnier but not totally flat. I tried them with both methods–loaf pan and as individual cookies. The loaf pan took a few more minutes than with the Mounds coconut and are a little stickier on the bottom, but worked basically the same. The drop cookies spread a little although the ones I pressed firmly together held better. This has definitely been a good science experiment! Interesting that yours were a little runny with the egg white…at least they all taste great! After being dismayed how many chemical additives I found in the shredded coconut products, I came across a product made by Bob’s Red Mill brand. I’ve used many of their other products, but this “flaked” coconut appealed to me with only one additive and nice big flakes of coconut meat. This made the two ingredients mix sit up nice and high despite being crammed into a cookie scoop for consistent size. I’ve never made coconut macaroons before (I work construction lol), but these came out amazingly good! High light centers and sweet crunchy caramelized edges with nice “toasting” over the entire surface of the macaroon. I’ve had so many requests from the guys, I’ll need to make at least three more batches. A man’s work is never done? Thanks for the heads up on these treats! I love it, Ed! Thank you for the great suggestion. I, too, dislike the additives and small amounts of this type of thing are ultimately justified under my “everything in moderation” approach. But when a healthier option is available, I am thrilled to hear about it. I am sure many others will be grateful for this tip as well. Thank you for taking the time to comment. Now get back to your baking…those men are waiting and they are going to be hungry!! This is an absolutely awesome post!! Thanks detective-you’re fabulous! Thank you very much, Eva! It was bothering me that these weren’t turning out consistently and when the initial trouble-shooting didn’t reveal anything, I had to dig deeper: ) Hopefully, this will prove helpful! I’d love to try these but have a milk allergy. Do you know of any substitutions for the condensed milk? Thank you! Thank you so much! I’ll give it a try an let u know. So appreciate your site and your help!! Thanks for the suggestion, Fay. I had never thought of that and it sounds delicious! I hope you enjoy, Lynda! Check the comments and look at the ingredients in your coconut before you proceed. Feel free to report back as to how they turn out! As of yet, no cookbook…perhaps some day! Thank you for your thoughtful comment! I can’t believe these only have 2 ingredients and thanks for the tip about the coconut with/without cornstarch. I’m going to give these a try real soon, thanks for sharing! Ive never seen a 9×13 loaf pan. I have a 9×13 cake pan or a 9×5 loaf pan. I use the loaf pan for banana bread. Is that the one I would use to make the bars? Want to make these for Christmas but want to make sure I do it right. Woops! I don’t know how I missed that, Mandy! You are absolutely right…it is a 9×5 loaf pan and I will make the correction. Thank you and I hope you enjoy them as much as we do! Okay perfect! Trying these Monday! Thanks. Thank you…and I hope they are a hit! Am baking these today. Ohhh myyy they smell heavenly. I couldn’t find coconut with cornstarch so I added cornstarch to the sc milk plus clear almond extract & vanilla. Cant wait to try them! They were kinda runny but also held their shape. Wish i could sen a pic. Wish you could, too, Lorelei! For me, the trick to keeping them in tact is to mound together well. Baking in the loaf pans works quite well, too. Hope you thought the taste was good enough to make again! I made a batch of these and was wondering if they’re supposed to be crispy all the way through like a cookie. The bottoms are brown and the coconut is toasted but the inside is soft. That sounds just right, Carmel. The browned parts get a bit crispy and the insides stay soft. I love the combination and hope you do, too. It sounds like they turned out perfectly! They did come out right then! Do the bars cone out with same texture? They are delicious. Yay, Carmel! I thought they sounded perfect! The bars are just the same. They require the extra cooking time because of the larger size but the preparation is a breeze. So glad you enjoy and thank you for letting me know! If you don’t have cornstarch to add, a baking substitute is 2 teaspoons of flour to it and mix well. Just remember that no matter what the additive, if you add something like that because of your cornstarch free coconut, 3-4 minutes has to be added to the baking time. I’m making my first batch tonight and yup, same issue, no cornstarch in my coconut. Well, I fooled with the amounts because our (here in Canada/Ontario-it may be different with each province depending on what grocery store you go to and how close you are to the border to US) regular sized bags of coconut are 200g so I used 1 & 2/3 bags of coconut. Our cans of sweetened condensed milk are 300ml. I used Eagle’s Brand. Not sure if there are bigger ones or not because the 14oz can that the original recipe calls for is approx. 400ml. I used one can of the 300ml Eagle’s Brand. I also added 2tblsp of flour like good ole Mom said lol. I tried just one macaroon on a cookie sheet to see what the results would be & yup. It went blaaaaahh lol. It oozed out to the size if a big cookie and went way too thin & dark on the edges. The inside was too sticky & needed to be cooked more but it would have burnt the edges completely. SO! I proceeded to get my cupcake tins out and cut circles of parchment paper to fit into the bottom of the cups. Doesn’t have to be up the sides. I added one more tblsp of flour to the mixture and started to drop the mixture into the center of the cups. A bit smaller than a tsp. maybe a bit bigger than a big gumball I’d say. I baked them at 350 degrees for anywhere between 15-18 minutes but a bit brown on the edges is probably best since they will stick much less to the plate or container they get put into. They stick to the sides just a bit after spreading out & puffing a bit so since I didn’t want to damage my non stick pan, I used a plastic camping knife to tap all around & release it from the pan. Tip though, don’t actually take them out of the cupcake tin until they’ve cooled quite a bit. They hold their shape lots better & don’t crumble apart. The circle of parchment paper almost just fell off on its own or stayed in the pan. I had never used the stuff, but Mom suggested it. A believer now lol. I melted a bit of chocolate in the microwave & used a spoon to drizzle them with chocolate afterwards & it adds a nice finishing touch. Otherwise, just eat! I did take pictures as I went of the exact ingredients, and paper in the cups etc. just let me know where to email them if you want a look. I hope the tweaks help the other ppl who were having issues with consistency. They’re worth making!! Thank you so much for your comments, Danielle! Wouldn’t it be nice if the cans and bags were all standard sizes?! For me, baking in the loaf pans is the fast and easy way–and sort of like in your cupcake tins, it holds them together well. I do find that pressing the mounds together, when baking as cookies, helps to reduce any spreading. Who knew this recipe would be turn into such a science experiment?? I love all the feedback and am always happy to have reason to experiment another time with this recipe. Whatever the form, they taste great! If you would like to send photos, you can post on my Facebook page or email through the contact page of this website. Thank you again!! Thank you very much, Tara! There is a long history of coconut lovers in my family. This recipe has turned into the number one favorite! WOW!! I made these cookies just now and they are amazing! I only had unsweetened coconut from the bulk barn and what i did was I added an extra cup of it they look just like yours they taste great I did not add egg whites but I did form them into firm mounds before baking. Thanks for the great feedback, Michelle! These are a definite favorite with my family, and I am so happy you enjoyed them, too! I wonder if using a small scoop would help keep them from spreading. In the interest of research, I will make them and test it out. I also wonder if chilling the mixture would aid in the finished product. At any rate, I’m anxious to make these cookies!! Yes, that should help, Regina. I find that pressing them together in a mound works well. The other option is to use the loaf pans. If you try, I would love to know what you think! I have been making these for at least 30 years – my grandmother gave me the recipe. 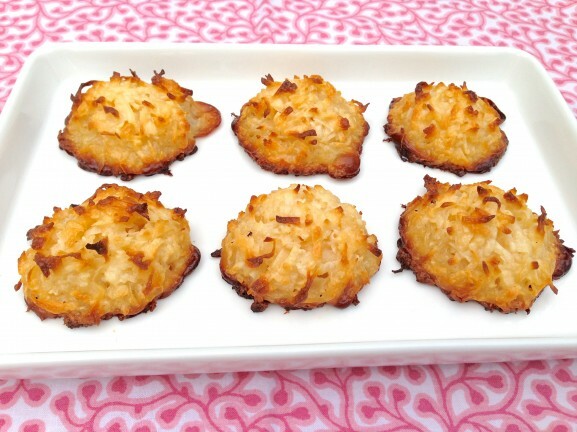 I used to make regular coconut macaroons, but these are SO easy and delicious that for the past 15 years I always start my holiday baking with this recipe, to “prime the pump,” if you will. First thing in the freezer, and first cookie to disappear! Sounds like the ideal way to kick of the baking season, Ena. They don’t last long here either! I just had to let you know that I have made these, from your recipe, since the first day I saw it. I have frozen them and found them to be just as tasty as fresh-baked. I prefer them made without the cornstarch coconut, but you do have to squeeze them together harder to prevent them spreading out. Or you can do what I did: I added a 1/4 tsp of cornstarch to the dry coconut (that didn’t have any previously added cornstarch) rather than an egg white, since I didn’t have any eggs, and it worked. My macaroons stayed puffy, browned nicely on the edges and stayed moist on the inside. I am taking a break right now from mixing up the next batch, too! This is such great feedback, Jacqueline. Thank you for taking the time to comment. I’m thrilled these are as much of a hit in your house as they are ours…they never last long! I tried these the first time and they did go flat but were still good. I bought a cookie scoop and placed them on parchment paper and they were perfect. My friend had chocolate bottoms and that was even better. Being a Celiac (no wheat flour) I thought my cookie days were over but not so. Thanks so much. I am so glad, Karen, and you are right…packing the “dough” together is the key to making these hold their shape when making in cookie form. A cookie scoop is really helpful! I think your blog is amazing. Love this recipe! Hi! These look incredible and I’d love to include them in a favor box for a baby shower. I just wanted to ask how long you think they’d stay good for? Thanks! Hi Shanna, These would be a wonderful to give at a shower. I usually store them in the refrigerator to prolong freshness. Well wrapped, they’ll keep for at least a week or two. At room temp they should stay fresh for several days. Hope that helps! So happy you liked, Joni, and love your idea to brown them a bit. A small ice cream scoop is a great help with these. Thanks for mentioning, Rosemary, and so glad they’re a hit! I have made these before and lost my recipe. Thankful to find them again. Also, I have made them with a little variation and they are even more amazing. I use Caramel flavored sweetened condensed milk. It can only be found around the holidays but if you like caramel it is a great added bonus. If you then dip them in chocolate, it makes them taste like the Samoa Girl Scout cookies. I’ve heard about the caramel condensed milk but have yet to see it. I’ll have to keep my eye out now that we’re in the holiday season. A Samoa version sounds wonderful! I made these today and baked them in my silicon muffin tins – PERFECTION!! A silicone muffin pan is a great idea for these, Valerie. So happy they’re a hit! I made a batch this evening adding beaten egg whites to the coconut and condensed milk mixture. I typically open the can of sweetened condensed milk with a can opener and pour into a measuring cup. This time, I removed the top of the can and was surprised to find a half inch of very thick milk stuck on the bottom of the can. Before opening the can, I had set it upside down on the counter for a few hours then gave it a good shake. Had I poured the milk from the can as I usually do, I would have used the thinner, less sugary milk. Doing so, the cookies may not have turned out so, firm, crispy and yummy. It’s funny that I’m reading this comment, because I just opened a can two days ago with the same result. I’m guessing that the longer the can sits–whether on the store shelf or at home–the more the solids settle. Thanks for pointing this out, Aja, and glad you enjoyed the macaroons! I came across your website in seach of the Cheese Crisps and found this recipe. 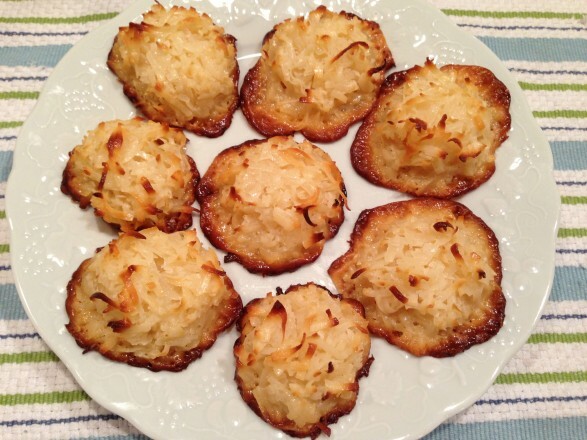 I make a similar coconut macaroon. If you add a second bag of coconut to the one can of sweetened condensed milk, you can mound the cookies by packing the uncooked mixture into an ice cream/cookie scoop. They are definately divine. What are the two ingredients? They’re right in the recipe, which you can print if you like. I love simple recipes, but sometimes simple is deceptive. Also, I tried a recipe where I put the coconut dough in cupcake papers ( to contain the spread ). Major fail. Tasted great, but did not release from the paper holders. But, upside, I can take these “fails” when I am alone and pry them off the paper and eat the coconut macaroon pieces all by my lonesome. I can appreciate your comment, Betty, and I hope this one will be a success! I have made these for years. Sometimes I add mini chocolate chips to the mix, or a Hershey’s kiss on top after baking. They are a favorite with all my coconut lovers. Love the addition of mini chips or a Hershey’s kiss, Sarah. Thanks for mentioning! I have always used sweetened for this recipe, Lisa, although some commenters have mentioned using unsweetened coconut with good results. I just made them….they came out really good …in shape,color and taste…. Thank so much for your recipe! My pleasure, Pinelopi. I’m so happy they were a success! Wonderful, Randy. I hope you enjoy them!